We understand that your time is valuable and sincerely apologize for the miscommunication regarding your sales appointment. If you continue to have questions or concerns, please contact us at customersupport@empiretoday.com. 1st appointment scheduled for June 16th between 11 a.m. and 1 p.m.
due to lack of employee time. I re-scheduled for 6/25/2014 between 11 a.m. and 1 p.m.
And received an e-mail on Sunday with the wrong date. So I called customer hotline and had it corrected. And he never checked the website and he works for the company for 5 years! and left! I guess there is a lot of room for improvement at this company! 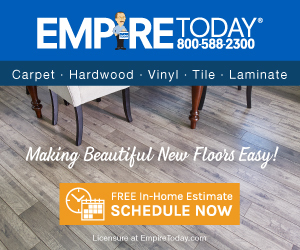 Thank you for scheduling your FREE In-Home estimate with Empire Today. We look forward to helping you update your home. Review #502508 is a subjective opinion of User502508. Whenever I am contemplating making a big purchase I visit this site! I have a relative who works for Empire and was thinking about having this company install it! So happy I read the reviews first!!!! To HomeDepot I go!!!! It's disappointing that you've read negative reviews, but we can assure you that we make any customer concern a top priority. We are committed to working with our customers until they are completely satisfied, and we'd be happy to speak with you to discuss your concerns and demonstrate our world-class service. Please call us at 888-588-2315 x4195 or email your contact information to customersupport@empiretoday.com. It’s disappointing that you’ve read negative reviews, but we can assure you that we take any customer concerns very seriously. We are committed to providing our customers with world-class service, and we’d like the opportunity to address your concerns. You can reach us at 888-588-2315 x4195 or customersupport@empiretoday.com. Thank you for bringing this to our attention. We regret that your sales appointment did not meet your expectations. We can assure you that this is not the level of service we expect for our customers, and we would like to know more about your experience and the product you were interested in. We will be contacting you shortly, and you can also reach us at 888-588-2315 x4195 or customersupport@empiretoday.com.